Travel capsule wardrobes are one of the five key principles of light travel. A capsule has clothing that works in a variety of situations and will also fit into a carry on. All of the pieces coordinate with each other and combine for different looks. They will also layer together to control temperature variation. This tutorial provides guidance (not rules) for planning a wardrobe. Modify this to fit your own personal needs. Don’t try to plan for all “what-if” contingencies or you’ll end up bringing your whole closet. Plan for a normal range of dress based on your destination, activities, and expected temperatures. This means that the clothes you bring for a trip to a beach resort will be different from the clothes for a trip to Paris. Plan for a normal range of temperatures. This means that a trip during the middle of summer will have slightly different items than a trip during the middle of winter. Consider taking wardrobe chameleons. These are clothing items that work under multiple situations. A light weight button down shirt with roll up sleeves will work in warm or cool weather. It also works as a “jacket” over another top. Long pants with roll up cuffs work in warm or cool weather. A skort works for hiking or in town. A black top adds glamor to any outfit. A 3/4 sleeve scoop neck tee may be worn alone or layered over another top like a sweater. Scarves, sweaters, leggings, and light long underwear can greatly extend the temperature range of your wardrobe without adding a lot of weight. These small and light weight items are key to making your wardrobe work when the temperature changes. Select lightweight clothing items to layer for a variation in looks. The layers also add warmth when needed. Layering tanks and light weight cardigans are great selections. Plan to do laundry. Make sure all of your items are washable. Some people sink wash along the way, some send laundry out once a week. Don’t forget that many hotels have laundry services. Drop your clothes off in the morning and pick them up after a day of sight seeing. Make sure your items will hang dry without wrinkling. Try doing a sink laundry test before the trip. Be careful not to bring too many items of clothing – it is far too easy to add “just one more shirt” or “just one more pair of pants” and end up with an extremely heavy bag. Subtract articles if you need to go lighter. I suggest getting rid of redundant items. Pick a skirt or a dress. Get rid of an extra pair of pants. Get rid of one or two tops. Consider bringing some technical clothing if you are planning any outdoors activities (hiking, climbing, canoeing, etc.). These are quite expensive but can take the beating of the outdoors while looking normal on the street. Great travel clothing is fashionable. A few investment pieces can greatly expand the usable range of the wardrobe. At most, you will be taking one weeks worth of clothes. It doesn’t sound like much but you’ll be combining the clothing to create far more than a weeks worth of outfits. A great capsule wardrobe of just 9 pieces gives you over 40 outfits! It is important do research your destination before you pack. You want to bring the right clothing for your trip. Check the weather at your destination. Find out what the temperature range will be. If it is warm, take more short sleeve tops. If cool, more long sleeve tops. Don’t know? Take tops with roll up sleeves! Bring a pair of tights or long underwear if you worry about cold. Check the dress at your destination. Is it casual or formal? Find out what activities you will be participating in. Many travel sites advocate wearing a black wardrobe. This almost always comes from someone who looks great in black. Forget that! Pick colors that look good on you. Navy, dark brown, and grey are great replacements for black. They are still dark enough to hide the dirt from travel but colorful enough to flatter your skin tone. Create a wardrobe based on dark neutrals if your destination is formal. Create a wardrobe based on light neutrals if your destination is casual. Denim blue may be treated as a dark neutral on casual trips. I find that choosing two neutral colors (one light, one dark) works well when I’m planning my wardrobe. Most of my clothing pieces are in these neutral colors to maximize my wardrobe. I usually use the dark neutral as my formal color and the light neutral as my casual/athletic color. After that I’ll pick one or two accent colors for variation. One of these colors will be dominant, the other complimentary. I’ll pick tops and accessories with the accents in them to pull the wardrobe together. If you have trouble with accent colors you may want to look at this post on using the color wheel for accessorizing. Choose a bed or a large space on the floor to lay out your wardrobe. This exercise is to review your capsule and make sure it actually works for you. Placing clothing items next to each other helps you visualize your outfits and create new ones. 2 bottoms (one dressy, one casual). One bottom should be a pair of pants just in case the weather turns. 3 tops (one dressy, one 3/4 length or long sleeves). The long sleeves are for protection from cold weather and mosquitos. The shirt should be light weight. One of the bottoms usually consists of a dress item – either dress pants or a skirt. If you are having problems getting started I suggest you check out my post on the Travel Capsule Wardrobe Core. It shows you how to start off with a few critical pieces and add items as needed. You now have everything you think you’ll need for travel. Make sure that your capsule will actually work for your trip. Mix, match, and layer all the items in the wardrobe to see how they work together. Try the outfits on to see if they work for you. This is especially important if you are layering clothing. Make sure you include clothes that you feel comfortable in and really like. You’ll be living in them for a week or longer. Who wants to continuously wear something they don’t enjoy? What items will I wear on the plane? What items will I wear to dress up? What items will I wear for an outdoors adventure? What items will I wear for museums, shopping, and cafes? What items will I wear if it gets incredibly cold? What items will I wear if it gets really hot? What will I wear for my (fill in the blanks) activity? Your wardrobe works if you can create at least one outfit for each scenario. If you can do two or more, you have chosen your pieces very well. Congratulations! Ask yourself if you really will use each item. Step 7 should give you a pretty clear idea of what clothing pieces work multiple times for your outfits. Were there any items that didn’t work well with the wardrobe? Travel guru Rick Steves says that each item should be worn at least 3 times or it gets left behind. Do you have multiples of any item, such as 2 black shirts? Either toss one item or swap out the shirt for another color. If an unexpected special occasion arises, you will do the same thing that you would do if you were at home. Go Shopping! After your trip is over, decide what worked and what didn’t. Use this information for planning the next wardrobe. Every time you create a capsule it gets easier. You will learn what works for your style of travel. A light weight skort for touring/hiking – far more versatile than shorts! A light sweater vest for extreme cold or traveling in the mountains. Note that all of the extender pieces have to work for their place in the wardrobe. If any clothing item can’t greatly enhance the capsule it doesn’t deserve room in your luggage. The pictures below show 56 different outfits you can get from mixing and layering. There are actually more combinations. Each picture shows a different way to wear one of the tops or dress from the capsule wardrobe. If you choose a different top from the day before most people won’t notice that you are repeating clothing. The suggested packing list has all the clothes you will ever want to take on a trip. You will not be taking all the items in the list. Instead, you will carefully select items out of the list. Try to cut items as much as possible and think hard before bringing any of the items listed as optional. If you do bring an optional item, you should leave another one out. Don’t forget that you’ll be carrying all of this around. Your goal is to travel light! (Optional) Dress pants in dark color – if you are taking a dress you may not need these. Casual pants in lighter neutral or in light color (roll up capris work well in summer). Cardigan or jacket in a dark color – this is your formal piece. (Optional) Cardigan in light color – this is your fun piece. Solid top in dark color – if it matches the dark color bottom so much the better. (Optional) Another nice top – it can be partly sheer to wear over other tops/swim suits, etc. (Optional) Skirt in dark color, or in print with all colors. This is interchangeable with a skort. How do you get a workable travel capsule without spending a lot of money? The answer is to first have a home capsule wardrobe based on good quality neutral pieces. Creating a travel capsule becomes a simple task when you are pulling well-loved items out of your home capsule. Through the years I have slowly added pieces to my home capsule wardrobe that will also work for travel. Every time I buy a new piece of clothing I make sure that it is washable, doesn’t wrinkle, and integrates with my other wardrobe pieces. Packing is now very easy when I know that all of the tops and bottoms work together. Consider creating your own capsule wardrobe out of your clothing at home. You’ll need less clothing, still have plenty of outfits, and can use the money you’ve saved on travel. The “Starting from Scratch” series from the Vivienne files gives you step by step instructions on how to create your own home capsule wardrobe. Updated on October 6 2012 – Included principle of dark for formal and light for casual. Updated on June 22 2013 – expanded comments on optional clothing and layering. Updated on June 22 2013 – added comments on the power of accessories. Updated on March 24 2014 – Updated capsule with versatile clothing selections, added in better accessories. Removed extreme example and added in extender pieces. Updated on March 28 2014 – Reformatted post to make sections of the tutorial clearer. Added text that explained each section of the tutorial. Moved suggested packing list down to the bottom of the post. Added notes on shopping your closet. Updated on April 17 2014 – Added in pictures of capsule combinations. Updated on July 17 2014 – Added in reference to the Vivienne Files “Starting from Scratch” capsule wardrobe series. Updated on February 27 2015 – Added in reference to Polyvore for initial wardrobe planning. Such great insight! I will definitely be taking in many of these tips for my upcoming 3-week adventure through France. I’m packing one bag and my itinerary spans through Paris-wear, beach-wear, outdoorsy wear and even business wear. I’m excited to read more of your posts! Thanks! Glad you are enjoying it. Please feel free to e-mail me if you have any questions on how to go about it. It may trigger ideas for another post! * Make sure you roll laundry up in a towel and squeeze out the extra water. This makes a huge difference. * Use inflatable hangers and maybe even a plastic skirt hanger to cause the front and back of your clothing item to separate. This allows extra air to flow through the garment. * Make sure you hang clothing in areas where there is a lot of air flow for convective drying. * if all else fails put the garment on and let your body heat dry it out. Your blog is awesome! Thanks for the details. 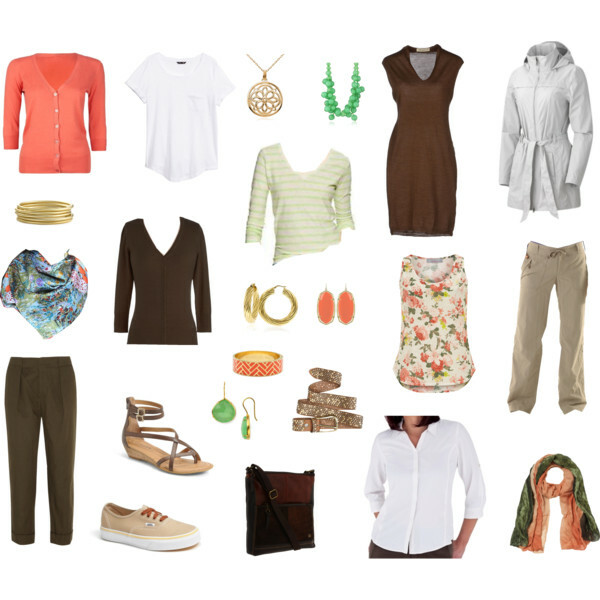 Many thanks from me simply for assembling a capsule wardrobe that includes brown! Most focus on black or navy, so examples like yours are hard to find. Me too – being a fair skinned redhead I don’t wear black and particularly in summer I need to be covered. I’ve always tried to mix/match my clothing and as I sew most of them, I seek out suitable fabrics in my chosen palette and add them as needed. One slightly negative comment – I’ve found when travelling I always need a dressed up outfit so I take a dress that will work anywhere (theatre, dinner etc) and go under several items because it’s the one thing that’s often hard to buy (especially outside big cities) and for me is always too short and costs too much if I find something. Don’t mind buying the odd top or undies, but buying a dress I’ll never wear again always seems a waste of money. Incidentally my current wardrobe for travelling is based on dark green and stone, with a couple of brights for accent. My pleasure! Any dark neutral will work for the base. I hope that you can create a capsule with colors that look great on you. Thank you so much. Having travelled many times I still find it a daunting task to pack. We usually go for about 4 months, travelling to Europe, U.K. and U.S.A. so we encounter all seasons. Its funny its just like being pregnant and wearing the clothes for months by the end of it all you are sick of the clothes never to wear them again, So last year I had black, and teal coloured clothes, this year it will be coral, I find I need colour but accessorise with scarves and jewellery. It totally makes a whole different outfit. Your blog is great for travelers that plan to backpack Europe! Thanks for all the great tips on layering. Glad it could help. It only takes one storm blowing in to make you go running for pants and a sweater. I cannot believe that I in my 50+ years of life, this is the first time I’ve heard of capsule packing; what a concept! And, I’m so happy to have found your blog! I love that you show outfits for the clothing items. While I can always pick out tops, bottoms, etc, seeing how you’ve put them all together helps me visualize my own “capsule” and assists me in picking the RIGHT items! I’m packing for three weeks in Spain (part of it on a cruise), and am so happy that I’ll be able to keep it all in a carry-on bag, Thank you for a wonderful teaching narrative! Glad to help! It takes a few tries to figure out what works best for you. You’ll get there! A million thanks! You mention Rick Steves…coincidentally, am taking his 2-week trip tour to Spain in September. I am a chronic over-packer and have promised myself, that “I can do it (pack light) this time!” I have been doing so much research and your blog just “clicked” for me: Your style, your colours, the no nonsense step by step approach. My big issue (no pun intended) is that I am a big and tall lady…my clothes is just plain bigger and heavier even when I do take less…plus I need big orthopedic shoes/sandals, so I will try to limit myself to 2 pairs max!…. I can’t wait to put your guidance into practice!!! I have quite a few months to choose and practice before packing. Thank you!! Shoulder season travel is tricky but you can still travel lightly. Check out my post on Packing a carry on for two (or more) climates. Also check out the pictorial example on how to layer. LL Bean has silk long underwear in extended sizes. They are great for cold rainy days and cold hotel rooms. All of the posts focus on layering for temperatures control. Make sure you have a good pair of water resistant shoes (better, waterproof). Ankle boots are great for transitional weather. Keep your sweaters on the thinner side for packing ease, and add in silk underwear or a base layer for additional warmth. A scarf is a MUST in Paris (that wind is cold). This is, by far, the best explanation of a capsule and/or light travel wardrobe I have ever seen. I have tried to do a capsule wardrobe before and, honestly, it was an epic fail. Your post gave me the confidence and motivation to try again. At the very least, it should make packing for my upcoming vacations much easier. 😉 Thank you, thank you, thank you! !